09/14 - DAREDEVIL The End? 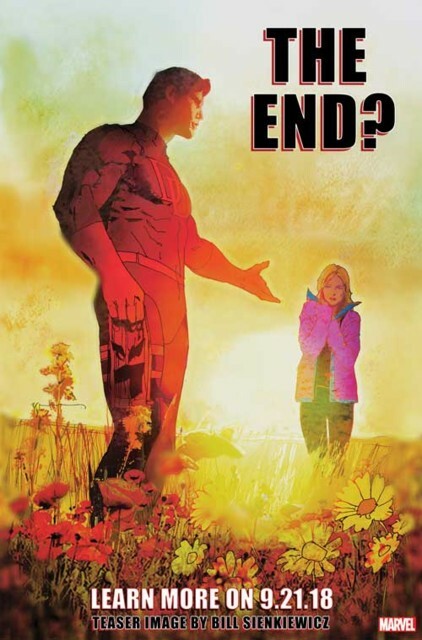 Marvel released a promo today, with only the words "The End?". Is that Matt with... Karen Page? "Marvel Comics have commissioned a Frank Miller Remastered Art variant, a Teaser Variant, a J Scott Campbell variant, a Marvel Netflix TV variant and a Bill Sienkiewicz variant." Is the title ending? Is Mike Murdock taking over? Is Karen Page coming back? Lots of questions, which will be answered hopefully on September 21!